These are letters i've been receiving since the Israeli agressions on Lebanon started on the 12 of july... These are almost diaries of a lebanese journalist friend living in Beirut..
Because so many of you asked for her picture: this is Kinda last winter when she was visiting her father in his office . I will miss you all. Some of you I never met, but I feel that you are all so close to me. More than that, you probably already know it: without you I would not have made it throughout this hell. You were there, by my side and that made me stronger. Everyday, you gave more meaning to all this: people’s stories were heard, people’s suffering was shared. This was what I could do to my people : tell some of their stories. Knowing that you will listen, knowing that you will care made the whole difference. As of yesterday, new stories will unveil : those returning to find .. nothing. 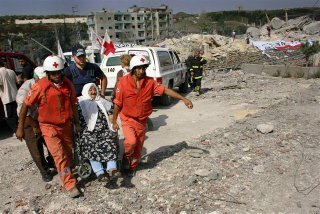 Those returning to find their loved ones under the rubble. But returning anyway. 7 a.m. ( or 8) was the official time for the cease fire on Monday morning. People were on the roads at 7 sharp. I am so proud. Sad, hurt, but proud. Proud of my people, proud of their resistance, proud of their commitment and dignity. 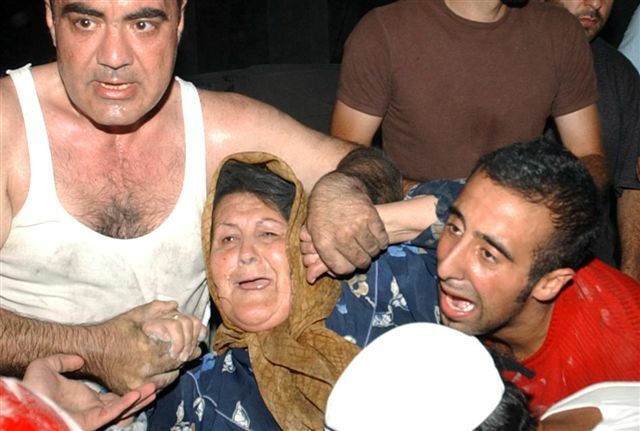 Hussein Ayoub, my colleague, finally found his mother today. Ten minutes ago actually. 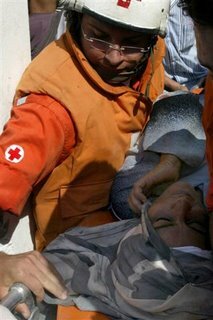 He went to Aynatha in the morning and the rescuers were able to pull her out of the rubble of a house where she, and some 17 other people had taken refuge. We don’t know when she was killed. But at least he was able to recognize her body. She was 75. His father was killed by the Israelis in 1972. I come from a small 'town' called Bourg El Barajneh in the southern suburbs of Beirut. My parents’ house is there, so as my brothers, uncles, aunts and cousins. This is the place of my grandfather and my great grandfather, an existence that goes back to thousands of years. 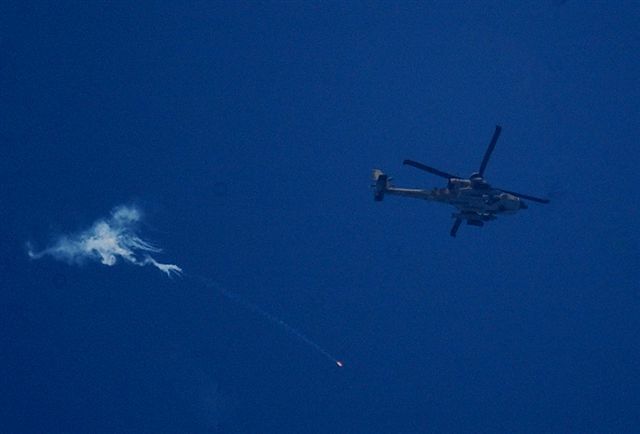 This morning Israel dropped leaflets over the town ordering the residents to evacuate. They will bomb, and when Israelis order evacuation expect the worst. My parents have never left their home, even during the worst fighting of the civil war including several Israeli invasions and assaults. We grew up, me and my two brothers, believing that our house is the safest on the planet. That was how my parents used to calm our fears down when we were young. 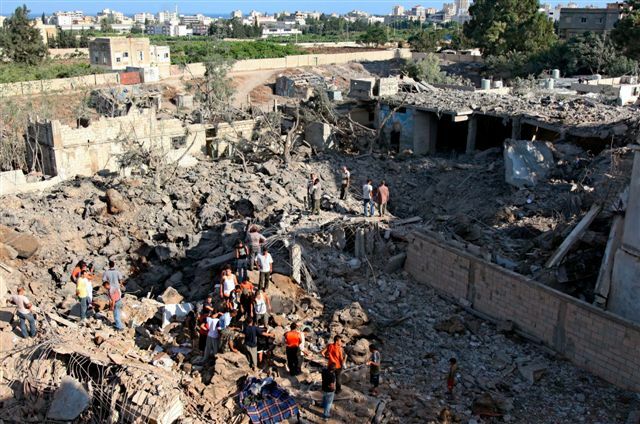 Our house is not safe anymore; Israel has made it not safe. My parents who are both in their sixties refused to leave, we had to convince them that their stay in the mountains is a fulfillment to a promise they made to their retired friends long time ago. So, they left two days ago, but my brothers are still there and they refuse to leave. The eldest, a school teacher, is assisting in rescue and aid works in the area. The second, a medical doctor, is present at the local hospital. They stayed to help their fellow town residents who have no friends or relatives to go to and feel so dignified that they don’t want to end up in a public school or a public garden as refugees. Innocent people who might not have the money or the means to leave are still there. They are numbered in thousands. Israel has taken the decision to bomb them all. 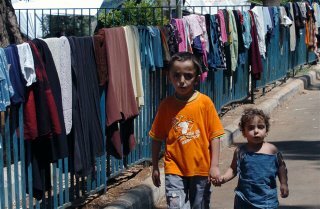 This is a crime against humanity, they will bomb, kill and then tell you ‘we told them to evacuate’. The Israeli army has transformed the Lebanese population into lottery balls and those sitting in the commander room in Tel Aviv enjoy mixing and picking up the ones they decide to destroy and kill. I have a great believe that for the F16 Israeli pilots it is just a computer game and the Lebanese people are like those computer characters trying to run and hide from the pilots constant fire. Remember among those characters are children and old people who can not run fast enough. I feel void. London ‘terror plot’ have taken the attention away. World media now has a different priority. News from Lebanon has been pushed down the ‘running order’. Israel can do whatever they want and no one outside the Arab world would even have a clue. I am not someone who believes in conspiracies, but this time I do. Those who were plotting to bomb the planes leaving Heathrow have made Israel a favor. The Israeli government was working hard to divert the British media, in specific, from transmitting the images of Lebanon’s victims. London’s ‘terror plot’ gave them what they wanted. Call it naivety, but massacres are to be expected when they hit Bourg El Barajneh, Hay esselum and Al Chiyah, the three districts that are still standing in the southern suburbs of Beirut. My greatest fear is that none of you will be watching or listening. Our stories will become history; my home town will become history." Everybody was clapping in the street half an hour ago. I looked from my window to find out the reason: the electricity was back. I was sitting in my office, sweating, trying to meet my deadline and to keep the mosquitoes away at the same time. So, the clapping in the street meant I was able to turn the AC on. But then my neighbors were clapping again. What now? Did Brazil win the world cup? No. It was Al Jazeera: it said Israel accepts an emergency cease fire. Well, so we’ll have a break tomorrow? Israeli air strikes and ground attacks continued on Saturday despite a U.N. resolution for a cease-fire, with missiles and artillery killing at least 19 people across Lebanon, mostly in the south. Rachaf, some 7 kilometers (4 miles) from the border, where at least 15 civilians were killed, security officials said. in the Zahrani region about halfway between Beirut and the border, killing three people and wounding five, officials said. 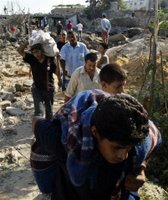 -A separate raid destroyed a bridge linking the southern cities of Tyre and Nabatiyeh with Sidon. -Shrapnel from missiles fired on the village of Insariyeh, halfway between Sidon and Tyre, hit a vehicle carrying Lebanese journalists working for a Swedish television channel, and one of them was wounded, security officials said. -Electricity was out in Tyre and Sidon, after Israeli warplanes struck transformers at power plants in both coastal cities. An official at the power plan in Sidon, George Makhoul, said it could be 10 days before power was restored. Lebanese and for humanitarian aid entering the country. Miles) from the border, officials said. The crossing remained open, but the road leading to it was impassable, and vehicles were spotted driving off-road through ditches early Saturday. City of Baalback, wounding three people. Another four people were injured in an air strike on a house west of Baalback, officials said. 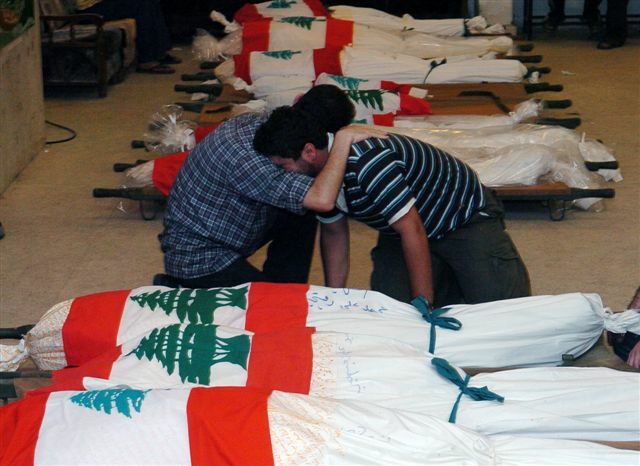 -A Lebanese soldier was killed overnight in an air raid near an army base in the western Bekaa Valley, the army said. Mohamad Husseini, the 3 years old boy in the pictures ( in the green t-shirt), and his family werefound alive when a red cross convoy reached Maaroub in the south todayFriday Aug 11 to try and rescue its residents. 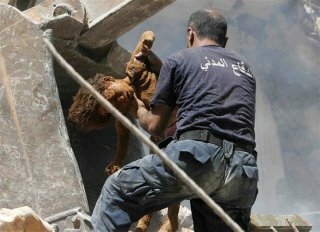 They couldn't reach the people whowere under the rubble in Maaroub, they left them there. However, they wereable to evacuate people who had walked from Arsoun , another village. The convoy also brought back the remains of a family who had been killed 2weeks ago in their car , on the road while attempting to flee the village. (JihadBazzi wrote an excellent article to be published in As-Safir tomorrow , for those of you who read Arabic). These are two comments that were posted on As’ad’s Angry Arab blog “in reaction” to my writings. 1- pleaaaaaase stop this wheeping all the time wheeping hanady salman this is too much!!! !she's exagerating the melodrame and that doesnt serve anything at the end. this isn’t litterature, this isn’t psychology, what does this wheeping mean??? 2- Hanady as in Hanady and Colmes show on Fox? Could anyone tell me what this show is ? I really don’t know. Is it bad? Israeli planes have blanketed the heart of Beirut, including the Lebanese government headquarters, with leaflets for the first time. trucks off the roads after 8 p.m., residents said. Hezbollah, the single-page documents said. one person and wounding 12, residents said. Baalbek, with theSyrian city of Homs, witnesses said. could not reach thousands trapped in the area. supplies by hand over a log across the Litani river. will lead to even more civilian deaths and suffering." Monday, warplanes attacked two cars travelling near a U.N.
Nations convoy, killing three people. Israeli soldiers in a cross-border raid on July 12.
which had been delayed since Tuesday. denied clearance," WFP spokesman Robin Lodge said. shortage was diesel fuel to run generators. Nations says up to 900,000 people have been displaced. wounded turning to people who have died," said Gillies. ability to do that, the consequences for civilians are dire." 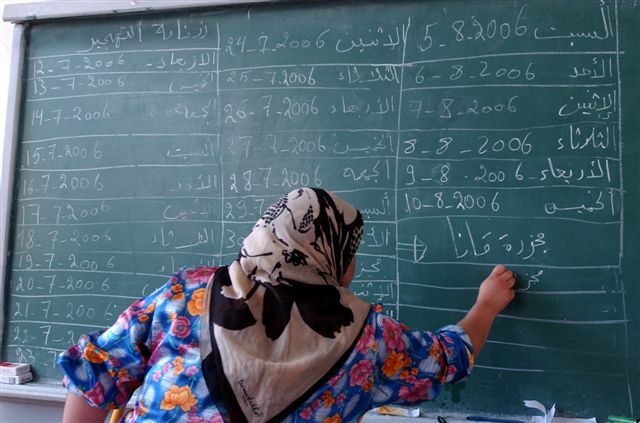 vital to restore access to aid in south Lebanon. forced almost one million people from their homes. granddaughter while she launched into a tirade against U.S. It seems it will be hell all over. 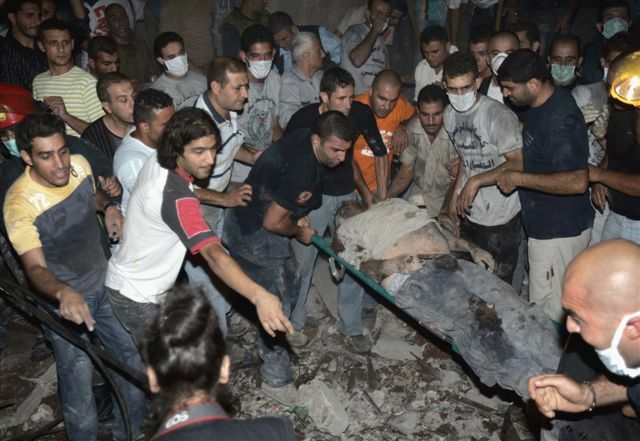 They bombed inside Beirut some half an hour ago. They bombed an old light house, so old no one ever remembers it exists. It’s some seven buildings away from my house. But it is also some 4 buildings away from Hariri’s house. They hit another transmission aerial, in Amshit, to the north from Beirut. It was on top of an old building that LPR have not used in years. There’s a small army unit based there too. They’re bombing Baalback in the East, Beddawi in the North and they’re hitting every single village from Tyre to Naqoura in the South. Most hospitals announced they finished their fuel reserves. There’s a ship loaded with fuel that came all the way from Algeria and has been waiting in the Lebanese (poisoned) waters for days for an Israeli OK to come in. In the newspaper, the two generators we have are out of order and they’re cutting the electricity in some 15 minutes. So, I’m writing this in a hurry. I feel so angry for what happened in London’s airport this morning. No words can describe my fury. I wish I could undo it all. I just can’t. All I can do is sit here, write my messages, try to get them through for those who care to read them, and pray I would still have an internet connection to do so for as long as possible. Last night I had a terrible thought: YOU ARE THE ONLY FRIENDS I HAVE LEFT. EVERYONE ELSE LEFT THE COUNTRY, EXCEPT FOR RULA. I feel we’re falling apart, one town after the other, one house after the other, one person after the other. But I know that deep inside, none of us lost faith : we know who our enemy is, we know what it’s capable of, and we know that this enemy knows that no matter what it does we will prevail. I really need to share this with you, it’s absolutely surreal!!! Yes, just put the blame on this catastrophy on one part and one part only. Hizbollah has ofcourse no guilt in this. Forget their actions and point the finger the other way. The government in Lebanon has no guilt although they have alowed a fascist religious murderous cult grow stronger and stronger. Founded and payd by Iran and backed up by Syria. Why has this remnants of a 15 year long mass sloughter been allowed to exist with its arsenal, untouched and quietly benn left a peace with its fascism. The other parts have laid down their guns, but not Hizbollah. Why? They have said that they have no interrest in Libanon, the lebanese people, only the islamic world state. The UN representative Jan Egeland heard a conversation with highrank members of Hizbollah that they were proud of all the civilians killed but they hoped for more. That kind of military tactic is cynical and evil. Hizbollas 2 500 rockets have only hit civilian targets in Israel where 1 000 000 lives under ground in shelters. 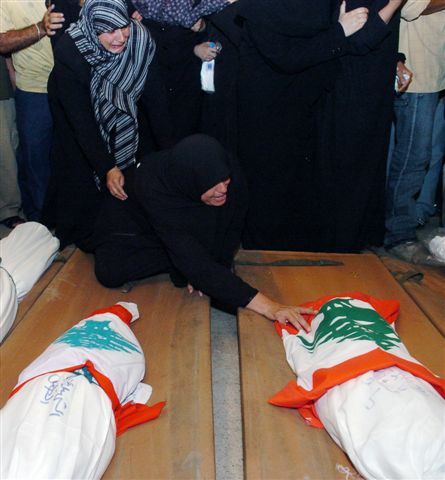 Hizbollah must be destroyd by Lebanon in a combined effort from every libanese. This evil must be driven out of your country, once and for all. It is so easy to blame only those who drops the bombs and ignoring those who provoced them to drop those bombs ( is this sentence is for real? ). 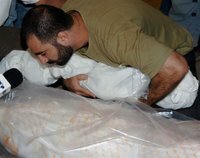 Killed israely civilians are being celebrated by palestinian but no israelis have done the same. They have done the opposite, they have marched against the killing of 1000 civilians in Lebanon. The conflict is old, complex and its roots are deep. Large groups are feeding from war, hate and conflict. Their base of power is these things, and they wont let go of that power easily. Hate makes you blind and irrationel. It open you up to any kind of madmen and their misdeeds. You seek to find justice for your hate. But you need to let it go. The middle east dont need more hatred, it need peace and love. Please dont close your eyes and walk into Hizbollahs trap. Fight them in words and thoughts. Tear down their wall build on lies. Hold up a mirror and let people see the true nature of Hizbollah and then cast them out of your heart and soul. Stop giving the israeli leaders more excuses for unleashing more terror and destruction ( and this one?) . For 58 years they have been fighting for their existence, for survival. When generations live in a state of crisis and war it creates an environment for psycopathic behaviour. May all the Gods in this world hear the cries of the innocent victims of this and other ongoing conflicts in our world today. Kongo, Somalia, Sri Lanka, Sudan, Kenya, Zimbabwe, Ivory Coast, Iraq, tchetchenya, Afghanistan, India/Pakistan and the countless dictaotorship. 8 - 10 000 000 are killed in these conflicts alone. When I went home last night, I rushed to Kinda’s bed as usual. I pulled her arm and kissed her hand. For a second, I thought that her arm remained in my hand. Her small white arm left her shoulder and was in my hand. Suddenly she became parts and bits. Her foot was at one end of the bed, her leg was at the other. Parts and bits. My baby is nothing but parts and bits. Now, todya, she is still in one piece. What is it that will prevent them from tearing her apart? What is it I can do to prevent them from tearing her apart? Baby Waad has in her mother’s arms. She stayed there when the building fell on them. It was the rescuer who separated them. Waad died in one piece. Too small to be cut in two: she is, was, ten days old. From the mother, only one arm remained. 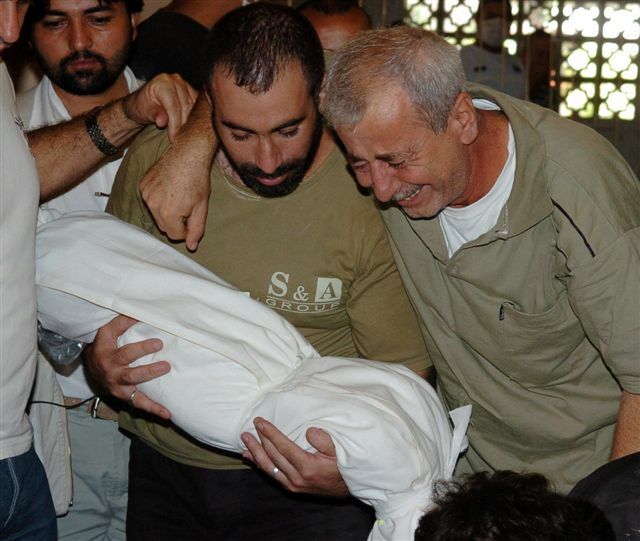 They killed baby Hadi too. He had his diapers on. His mother should have known better. She should have changed his diaper; it looked really heavy in the morgue. 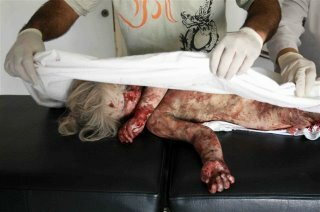 They killed baby Manal. 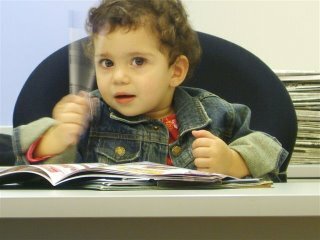 Baby Mohamad, baby Ali, baby every single name in the Arabic language. Those they missed here, they killed in Palestine. “ya Ali” , the man was calling in Srifa. “Ya Ali, Ya batal” . That’s how he was calling his sun, “hero”. The hero never answered back. The hero was under the rubble. Along others who are still under the rubble in Srifa. Along others who are still under the rubble in Houla, Aynatha, Aytaroun, Hallousiyeh, Taybeh, Maroon el Ras, Bint Jbeil. People are rotting under the rubble in every single village south of the Litany River in Southern Lebanon. There was a day, at the beginning of this, when we felt sorry for those who lost their homes. Reporters would use their best writing skills to describe how bad one might feel if one looses one’s house: in houses, there are photo albums, there are books, music, and “memories”, the reporters said. It is not poetic to mention winter clothes, kitchen utensils, underwear, fridges, heaters, air conditioners, cars and other trivial details people in poor neighborhoods spend years saving to get. Talking about left behind medicine, IDs, deeds, medical reports, birth certificates and other “vital” stuff is more likely to move the readers. Today, under the rubble, the house owners vanish. Forever they will keep their books, their music, their photos, their winter clothes, their medicine; they can hug their kids indefinitely. Under the rubble, one village after the other, one house after the other, memories take their owners along. Ashes. Pity the living, pity those who are left behind. Pity those who are dreading the day when it will be their turn to run down the streets, screaming, collecting the legs and arms of their loved ones, calling their names so loud their voices would reach the skies. -A man steps inside his house. It’s a nice house, overlooking the beach. The man, however, doesn’t even look towards the window. He rushes to the kitchen, hugs his wife, takes his daughter into his arms, and makes funny faces to his toddler trying to make him smile. The man looks tired, he hasn’t shaved in a while, and he certainly needs a shower. He takes a shower, eats lunch with his family, hands his wife a sum of money and goes to bed. The wife calls the children to go with her to the supermarket: they’ll shop for food and toys from the husband’s wage. The kids are excited and noisy; “shush”, she says putting her finger on her lips while they’re leaving the house, “your dad needs to rest. He has to go back to work tomorrow. He works hard, you know”. The dad is an Israeli soldier. He works hard, Marwa knows that. 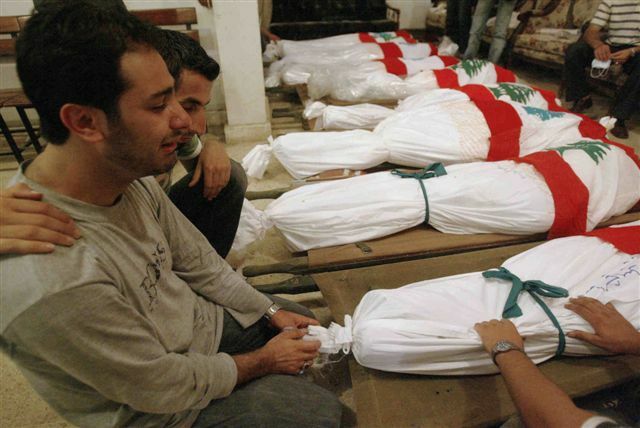 -Marwa (10) was in the small pick-up with 22 other people, her family and relatives, on July 15th 2006. They were trying to make it out of their village, Marwaheen. 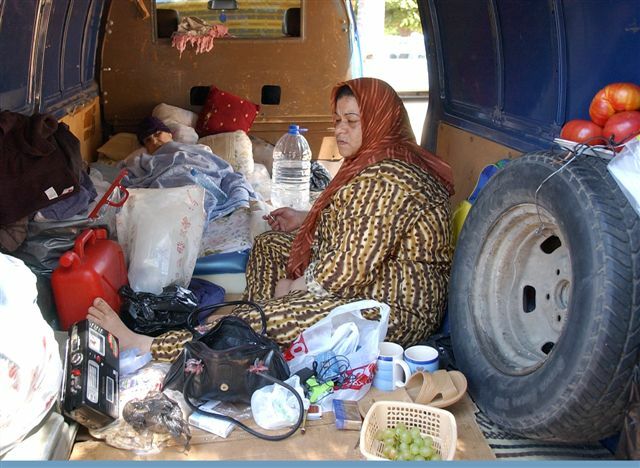 They believed the Israeli ultimatum that told them to evacuate the village within 2 hours. They know that when it comes to bombing, when Israel says, Israel does. 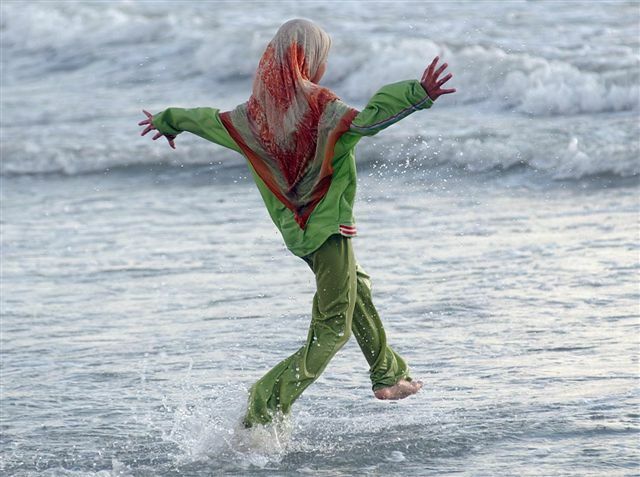 So, while her parents were trying to figure out where they should go after the nearby UN base refused to hide them, Marwa and her sisters were playing “beit byout”. Marwa was pretending she was answering a very important phone call on a fictive phone, and her sister Mirna (12) was pretending she was holding a tray with drinks on it , offering them to fictive guests speaking with an Egyptian accent. Then suddenly, there was a huge BOUM. “The wind carried me far away , I woke up on the nearby rocks. Next to me, mama and Mirna were sleeping. I went to them to wake them up but the plane saw me and came towards me so I ran away. My brother Wissam was hit in his leg and he could not reach me, he was hiding behind a rock and when the ambulance came he was waving to them to stop. Mirna was sleeping the whole time ”. That is what Marwa recalls. 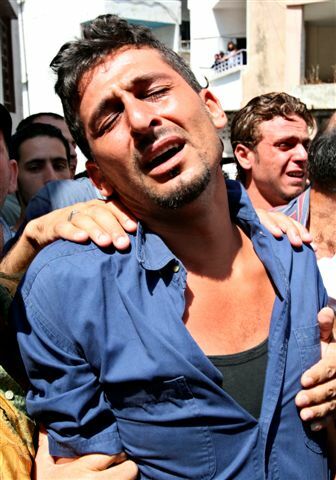 But Wissam ( 15) tells a different story :” after the first explosion, Mirna was standing alone, crying. I crawled towards her because my leg was bleeding but a shell fell between us before I could reach her, and Mirna was no more”. Marwa, from her hospital bed in Beirut, calls Mirna everyday but she always gets Wissam instead. For her, Mirna is still sleeping. During her first five days in the hospital where they treating her wounds and burns, Marwa would wake up in the middle of the night, yelling and crying for her mother. Marwa is safe now in a house in Beirut with a sister who was not in the south when that little incident happen. Marwa is waiting for her mother Zahra ( 51) , Mirna and her brother Hadi to wake up and join her in her refuge. 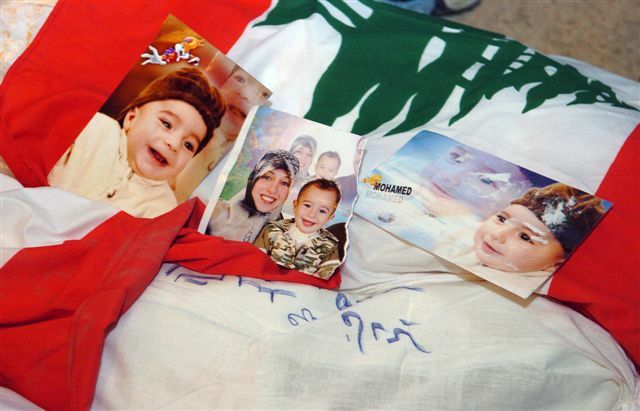 She keeps two pictures of Hadi : one of him when he was eight month old, and another when he was five, days before he was killed. Marwa wears a pink sweater her mom had bought her and refuses to change it. 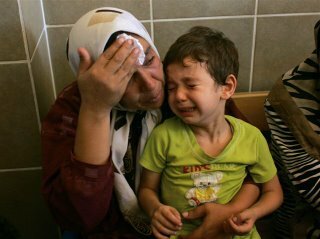 She says that she prays every night before she sleeps “ I read the Fatiha and pray that my mom will come soon , that the war ends .” then she adds shyly “I also ask God not to forgive Israel. I know this is mean, but I promise that when the war will be over I will stop asking that”. Marwa won’t keep her promise. Sometime soon , even before the war is over, she will find out her mother, sister and brother are not sleeping anymore.